Cook bacon in large skillet over medium heat until crisp. Drain on paper towels. Discard drippings. 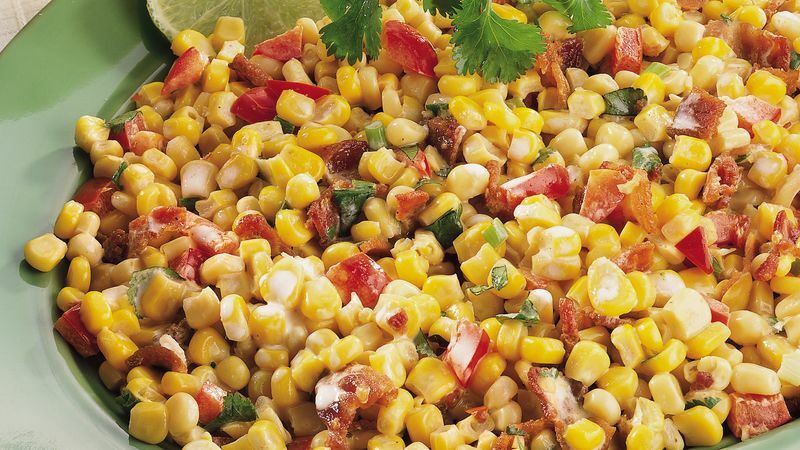 In same skillet, combine cooked bacon, onions, bell pepper and corn. Reduce heat to low; cook 5 minutes or until thoroughly heated, stirring occasionally. Meanwhile, in small bowl, combine salad dressing, lime juice, cumin and red pepper flakes; mix well. Add dressing mixture to corn mixture; mix well. Remove skillet from heat. Stir in chopped cilantro. Garnish with lime slices and cilantro sprigs.